More martial arts. 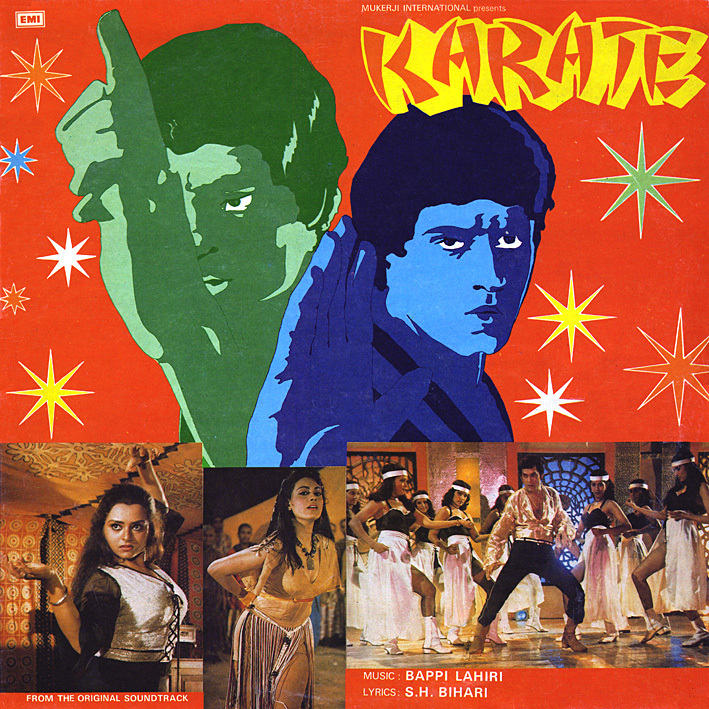 Bappi Lahiri is all over the place on 'Karate', making use of every trick in the book, every cliché found on a disco dancefloor. But guess what? It works. Sort of. Super funky bass riffs, relentless percussion (the title track); madcap effects, cheesiness aplenty ('Tum Tum Tumba'); packing I don't know how many different musical themes into a single, amazing intro ('Bazi Pyar Ki'); sonic effects, bombastic arrangements, the obligatory 'I Feel Love' synth line ('Do Diwane Pyar Ke') – for all his derivativeness (lots) and downright stealing (some), Bappi really is a disco sub-genre all on his own. And to wind things down, the guitar on 'Aaja Gale Too Lagale' and 'Ma Ae Ma' is more than a little gorgeous. Many Thanks for this fabulous album of Bappi Lahiri. Expecting some RD Burman numbers in the coming days. How are you with the time? And your label. I had to stop my my mixes "Votre Accent Est charmant Mademoiselle" for the radio but finally i decided to develop another project. To make 4 mixes every year since the begining of recording around the world. Another history of music. I'm happy to see you develop Bhappi Lahiri. When i was teenager all my neighbour was Tamoul so i heard a lot of indian music. And i allways mixed the Lahiri's disco. Thanks. I probably still have the odd misgiving about Bappi, but he has undeniably made some good soundtracks. Amit, there'll be more Burman, but not for a couple of months. Thanks so much for this. I saw the DVD for this film in Jackson Heights this weekend, but didn't for some reason pick it up. Of course I then looked for the soundtrack, but couldn't find it on CD. So ... much appreciated, and timely (for me)!